Lifetime garden sheds provide a different layout for your outdoor storage needs than the traditional 8-foot wide Lifetime shed design. The garden shed layout features the entry way on the 10-foot side, instead of the 8-foot side. This allows more side to side storage. The 10-foot side is also extendable (up to 15 feet without voiding the warranty). The 60178 includes 2 90x9 inch shelves to help provide you some areas to start storing your garden equipment and outdoors supplies. Additional shelving units can be purchased separately for more places to store your outside items. 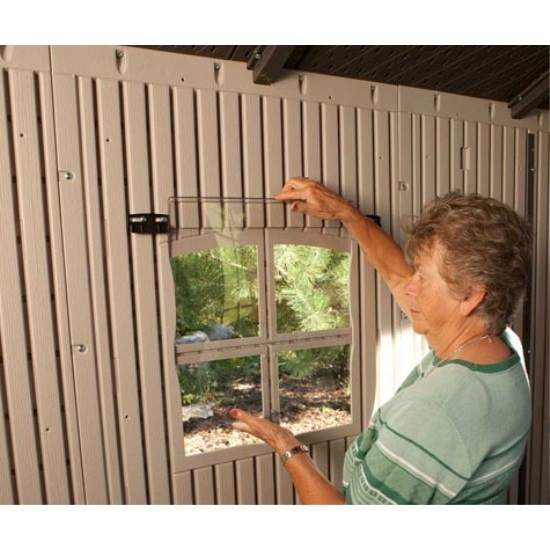 To help vent the inside of your shed, the 60178 Lifetime storage shed includes two top vents placed on either end panel at the peak of the panel. On the backside of the shed, there is also an additional window that can be opened halfway to improve airflow in and out of the shed. Order your Lifetime storage sheds here. The Bottom Line: The Lifetime 60178 Shed is ahead of the pack due to its steel reinforcement in the walls and the steel roof trusses. While most competitors use very little metal in their wall construction, the Sentinel plastic sheds have double-wall technology that is unmatched in quality and design. Need a few more reasons to buy a Lifetime Sentinel Shed? 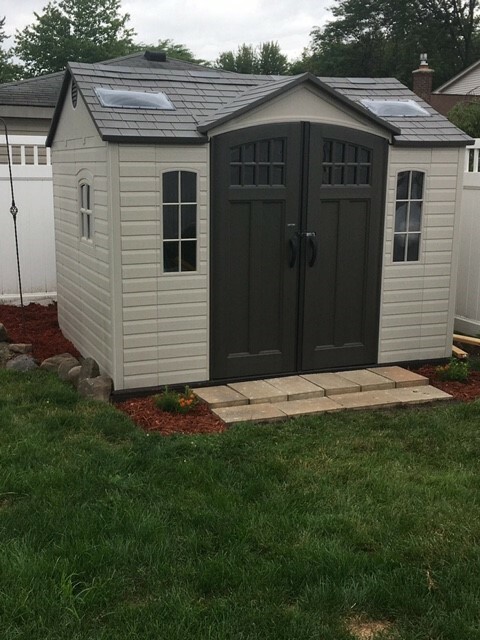 Lifetime Shed Features Attractive Appearance and Design - With wood grain-molding, a simulated shingled roof and a natural color scheme this shed was designed to be an attractive complement to your yard! 2. Lifetime Sheds Are Low Maintenance - No need to worry about a metal shed rusting or painting a woodshed! Made of Stain Resistant Polyethylene - Easy to Clean! Resistant to Oil, Solvents, and Stains. UV-Protected to Prevent Fading and Cracking. 10 Foot x 8 Foot Lifetime Shed Storage Unit Never Needs Painting. 3. 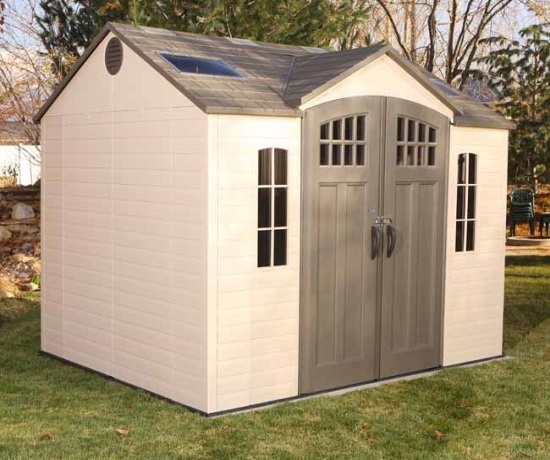 Lifetime 60178 Garden Shed Features Superior Sturdy, Solid Steel-Reinforced Quality Construction - Lifetime has specialized for many years in high-density plastics and metals - now they are bringing this expertise in quality to the outdoor market! Steel Trusses Provide Roof Strength. Secure-Fastened Assembly Ensures Stability and Durability. 4. 60178 10x8 is Upgradeable, Expandable, and Customizable - One size fits all? Not with this shed - You have the opportunity to make your shed larger and customize your shed with many different accessories to make it just the way you want it. Add 2 1/2 Shed Extensions with or without window. Allow increased access by adding doors to the back of your shed. 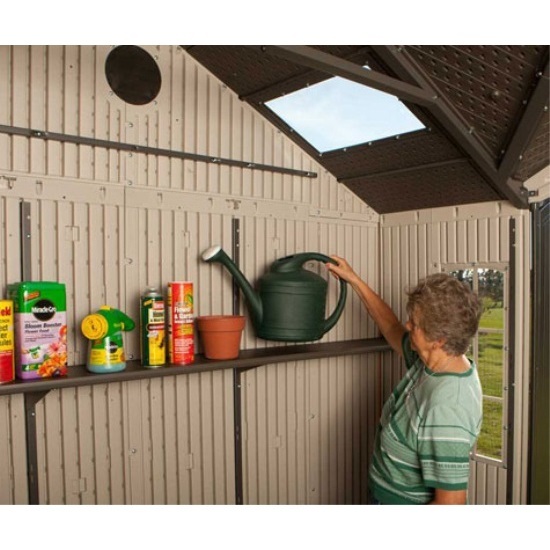 Additional shelving is optional on 10x8 Outdoor Sheds. Shutters make the outside look even nicer. Additional peg strips make organizing easy. Extra lighting for more visibility at night. 5. 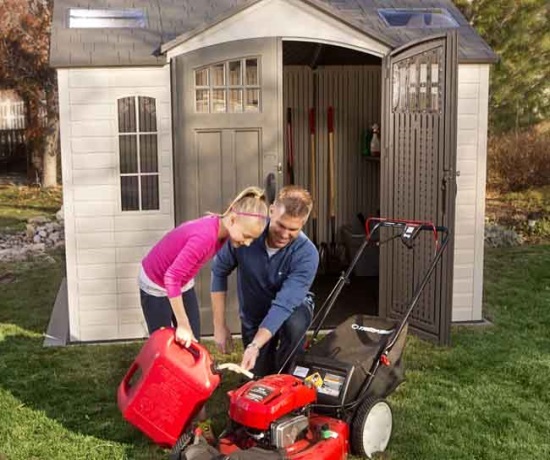 Lifetime Outdoor Garden Sheds are Spacious - Without having to crouch down to enter or move around, space can be used to stack boxes, park a riding lawn mower, or even as a garden planting room. Same spacious dimensions as the Lifetime Brighton Shed. 80" of Head Room and Spacious Walk-Around Interior promote versatility. Spacious Outdoor Storage Building, 8 ceilings, walk room, plenty of storage room, efficiently designed use of all space. 56" Wide x 76" High Door Opening. The upper right and left corners of the door opening are 70" high. Inside the shed: 94" at the tallest height, each truss is 80" high from the ground. 6. Innovative Design with Many Special Features and Extras: This shed was designed with someone in mind ... the customer! Shatterproof window that open and lock and skylights create a fresh and pleasant atmosphere. Built In Shelving System (2 front shelves) keeps tools and supplies tidy. Lockable Doors with Internal Latching Mechanism. Window and vents provide Increased Ventilation. Screened Vents Provide Airflow and Help Keep Pests Out. Full Length Steel Hinge System. 7. Weather Resistant, Environment Ready - Double-wall, steel-reinforced construction, and steel roof trusses make the sheds structurally sound, so they will not buckle during storms or dent during everyday use. Steep Roof Allows for Quick Drainage of Rain and Snow. Since they are made without wood, termites are not attracted to Lifetime sheds. Screened vents allow for airflow while keeping out rodents that could otherwise destroy belongings. Weather-Sealed Seams Keep Interior Dry. 8. Outstanding Value - Save money by buying a shed that is low maintenance and built to last! These high-quality sheds will last a long time. Our sheds are made of polyethylene, a plastic that will not degrade, leading to costly maintenance. 9. Proudly Made In the USA - You can be assured that the quality of the Lifetime Outdoor Storage Shed is the best in the world! All of our sheds are made in the USA! 10. Ten Year Warranty - The manufacturer backs that American-made quality up by offering the best warranty in the business - A 10-year warranty that covers everything on the shed top to bottom! Important Note: Please check your local city, county, and neighborhood restrictions before purchasing this shed. Competitive Edge Sheds manufactured by Lifetime are delivered via curbside. A wooden foundation or concrete slab are recommended for the shed to set on. The instructions show how to build both the wooden foundation or concrete slab. *The 60178 Storage Shed can be extended up to 15 without losing its integrity or voiding the warranty. Nominal Dimensions - 10 Ft. x 8 Ft.
Footprint - 118 inches w x 94 inches d.
Exterior Width - 116 inches. Exterior Roof Width - 120 inches. Exterior Depth - 92 inches. Exterior Roof Depth - 96 inches. Exterior Height - 96 inches. Eve Depth - 2 inches. Fascia Height - 1.5 inches. Door Opening Dimensions - 56 inches x 76 inches. Window Opening Dimensions - 16.5 inches w x 16.5 inches h.
Interior Width - 114 inches. Interior Depth - 90 inches. Interior Height - Minimum 71 inches. Interior Height - Maximum 95 inches. Square Feet - 71.3 square feet. Cubic Feet - 491.5 cubic feet. Material of Construction - Powder-Coated Steel and Double-Wall Polyethylene Plastic. Roof Structure - Double-Wall Polyethylene Plastic Panels. Roof Support Trusses - Five (5) Steel A-Frame Trusses. Wall Structure - Steel-Reinforced Double-Wall Polyethylene Plastic Panels. Floor Structure - Slip-Resistant Double-Wall Polyethylene Plastic. Doors Structure - Textured Steel-Reinforced Double-Wall Polyethylene Plastic. Door Hinges - Full Length Galvanized Steel Hinge Pins. Door Handle - High-Impact Plastic Handles with Metal Latch. Door Latching - Internal Spring Latch Mechanism. Door Locking - Exterior Padlock Loop with Two (2) High-Impact Plastic Deadbolts on Interior of Left Door. Screened Vents - Two (2)Includes Screened Vents (front and rear). Window - One (1) 17 inches w x 17 inches h Polycarbonate Window - Opens Half Way. 2 stationary windows next to the doorway on the 10-foot side allow more natural light into the shed (these windows do not open). Included Skylights - Four (4) Polypropylene Skylights. Two (2) large dome skylights. Includes Shelves - Two (2) 90 inch W x 9 inch D.
Assembly - Secure-Fastened Assembly with High Grade Metal Screws. You will need a perfectly level surface on which to start assembly. I had 12? X 12? blocks set in sand for my previous building and while this worked OK it was not perfect. After assembly, we had to ?shim? up one corner and some of the wall in order to get the walls to fit. When laying the floor out for installation it appears to be a rather simple and easy process. BE SURE and be ready to do the floor assemble as soon as possible We let the panels sit in the 90 degree plus temperature in Texas and one of the panels started to warp, making it very difficult to assemble the floor. After a period of time the floor came together.Site cut me off! This shed was easily assembled by three people. We had all the trusses assembled and windows installed the night before and the next day we had the shed completely assembled in approx. six and a half hours. One door was slightly higher than the other but following directions, we were able to bring the doors into alignment very easy. Hardly Looks Like A Shed. Fits Well By Our House. A: We have found that customers are far more successful at getting more competitive local assembly/installation rates if you join a local Facebook classifieds group and create a post like, "Looking for a licensed and insured handyman to assembly my ......." You are likely to get several competitive bids eliminating the middle man. Q: How many hooks come with 10x8 shed? A: You'll want to purchase 0113 the peg strips with tool hooks. Q: Does the 8/10 come with a floor? A: Yes, it does come with the floor. It is still recommended/required that you install it either on a concrete slab or build a wooden base. Details on that are included in the instruction manual under the "instruction" tab below the picture on our website. Q: What color is this shed? 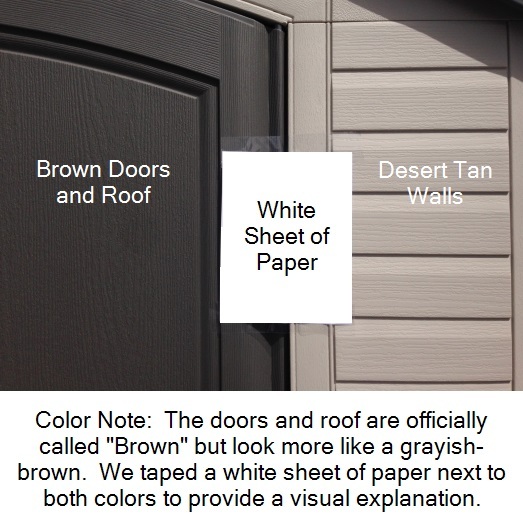 A: This shed is desert tan with brown doors and roof. Q: Is there any kind of foundation leveling kit for this model? I have gravel in my backyard not sure what I will need for foundation? Q: What is the width of the door opening with both door's open? A: 56" Wide x 76" High Door Opening. Q: Will the model 60095 work with the 2.5 ft extension kit? It appears to have 4 small skylights not a full ridge one, but I can't tell if it would work with the style of the doors. A: There are two extension kits that work with this particular shed (6422 and 60142). However, please keep in mind that if you add an extension kit you must add it to the right or left side of the door. 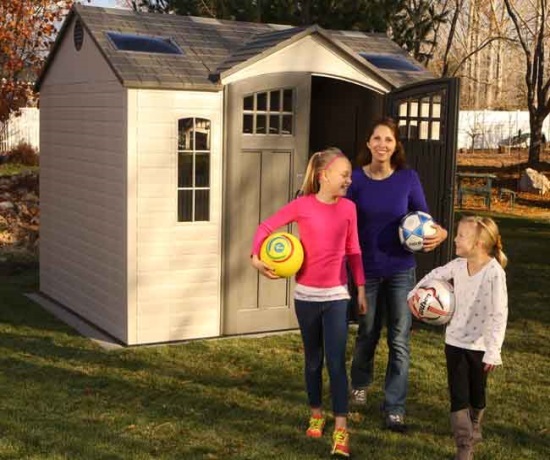 You would need to order two kits if you want the shed to be completely symmetrical. Q: Is there any shipping charge to NY 11772 and how long would shipping take? How does this compare to Sam's Club storage shed? Q: Is there a floor with this shed 60095? A: Yes, all lifetime sheds include a floor. Q: Is there a floor ? A: All Lifetime Sheds include a floor. Q: How do you secure the shed to keep it from blowing over in high winds? I live in Arlington, TX and it can be very windy several times a yr.
A: You can anchor it to the concrete using concrete anchors purchased locally at your hardware store. Q: How can I get the 2 ft extension for the 60095 10 x 8 storage shed and what is the price? A: You can add either the 6422 or the 6424 extension kit to this shed. This will add 2.5 ft. to the width of the shed (12.5 x 8). There is not a smaller extension kit that these models for this shed. Q: What is the shipping cost to Vancouver Canada? A: Please add the item to your cart and type in your postal code to get an accurate freight quote to your location in Canada. Q: Do I need to be home for the delivery? A: Yes, this item ships via an LTL for a curbside delivery. This type of delivery requires you to be home to sign for the delivery. Appointments are scheduled through the freight company before delivery. Q: Will the driver move the boxes to the backyard (or anywhere on the delivery property)? A: No. The delivery is curbside. The driver is contracted to bring the package to your address only. Pleas make sure you have sufficient help available to move the packages when delivered. Most packages can be handled by two people, depending on size. Q: Do I need to pull the boxes off the truck? A: Most of the delivery trucking companies we use for this shed will have machines on the back of their trucks, called lift gates, which will lower the boxes to the ground for you. However, in rare instances, the freight truck will not have that machine handy. In those cases, the boxes will need to be pulled off one at a time. Please make sure you plan your appointment accordingly so you sufficient help. A: Yes, we can ship this item to Canada. However, as our cost to do so is very high. Canadian customers are frequently able to get the product across the border cheaper than we can. If you have a United States address we can ship to, you will typically save money bringing it across the border, paying the required fees, then for us to ship directly to you. Shipping costs on the shed is noted in the "Check Ship Rates" link at the top of the listing. 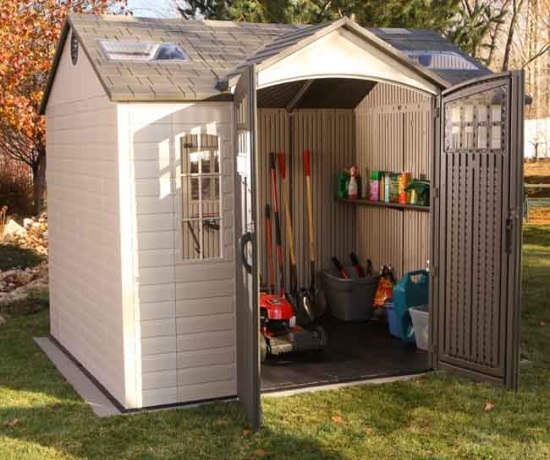 Q: What is the difference between the 60095 Lifetime garden shed and the 60005? 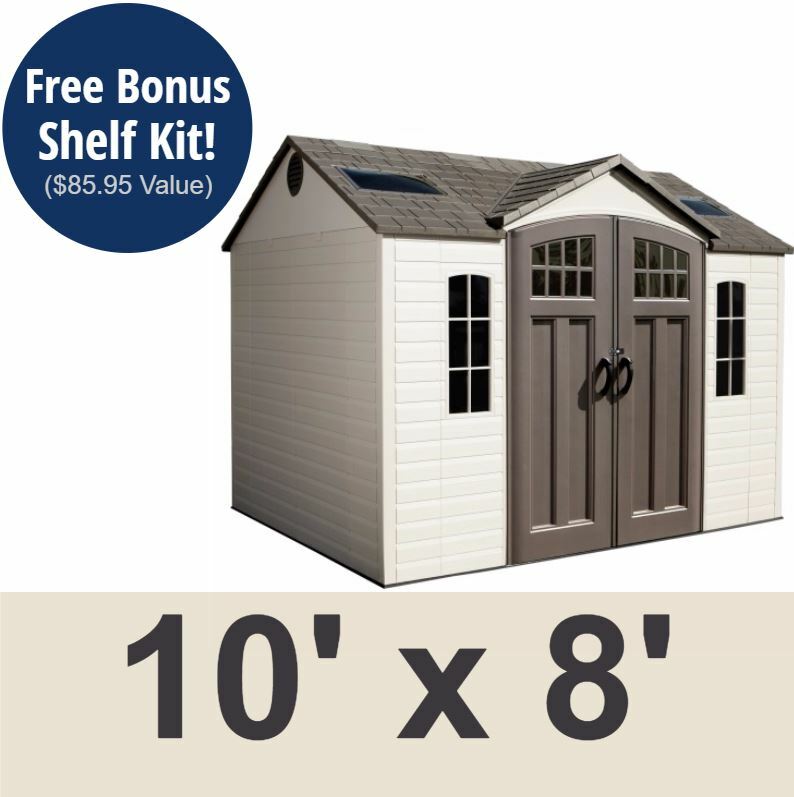 A: The only difference between these two sheds is the included shelving and storage features. The 60095 comes with 2 90x9 inch shelves. The 60005 has those same 2 90x9 inch shelves and also includes 2 corner shelves and 1 16-inch peg strip with tool hooks. Please note that these videos are meant to provide general information for this product and have been created by individuals that have owned or used this shed. The details of the 60095 are listed on our website listing. Please do not use specific details from the video to know what comes with the 60095. Regarding Shipping. 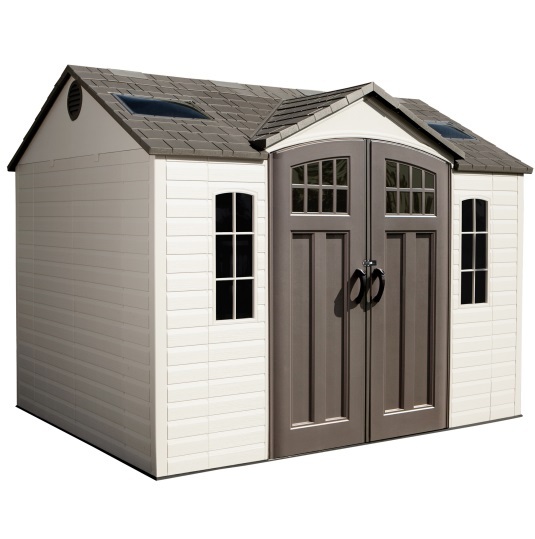 Orders for the 60095 Lifetime Garden Shed generally leave the warehouse within 2 business days. This product ships directly from Lifetime Products in Clearfield, UT. Delivery of this product is via a curbside delivery through an ltl carrier. The customer must be present to sign for the package and move the boxes where they need on the delivery property. Delivery appointments are scheduled through the delivery company before delivery is attempted. The customer can either contact the freight company themselves once they have the tracking number, or they can wait for the freight company to contact them to schedule the appointment. Ltl freight carriers will frequently have some flexibility with scheduling delivery once the product at the delivery terminal within 7 days (not business days) of the item arriving at the terminal. The terminal can hold on to the item longer than that as well, but they will begin charging storage fees to the customer after 7 days of the product sitting at the delivery terminal. Call or email us with any questions. 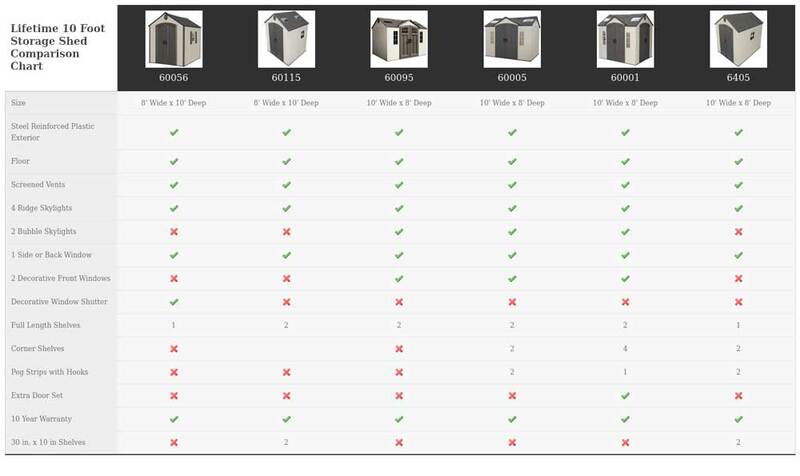 To help you prepare for the delivery and have sufficient help available, below are the approximate shipping dimensions and weights of the packages for the 60095 garden shed. Box 1: 95.31 inches x 32 inches x 15.375 inches; weighs about 326 lbs. Box 2: 95.31 inches x 32 inches x 12 inches; weighs about 186 lbs.